Dr. Theodore Seuss Geisel in 1957, with some of his books. Theodor Seuss Geisel (March 2, 1904 – September 24, 1991) is the author of several classic children's books, which he wrote under the pen name of Dr. Seuss. Among his most famous books are The Cat in the Hat, How the Grinch Stole Christmas, and Green Eggs and Ham. Geisel created a world of whimsical characters, and his use of rhythm and rhyme made him a pioneer in techniques for facilitating reading skills in children. Also a cartoonist, he illustrated all his own books. Before he wrote books for children, Geisel had been a magazine writer, cartoonist and advertising artist. Patriotic and politically active, he began his career as a writer and propagandist for the American war effort against Nazi Germany, and some of his children's books are said to contain social messages. Geisel refused to endorse the marketing of his characters into any product that would have a negative impact on children. In all, Geisel wrote and illustrated 44 children's books. His books have been translated into more than 15 languages and more than 200 million copies have been sold around the world. In 1984, Geisel was awarded a Pulitzer Prize for his "special contribution over nearly half a century to the education and enjoyment of America's children and their parents." Theodor Seuss Geisel enjoyed an ideal and happy childhood. He was born on March 2, 1904, and grew up in Springfield, Massachusetts. His house was located on 74 Fairfield Street, six blocks from the zoo (where his father worked) and three blocks from the local library. He was a creative and energetic child who excelled academically. His father had great hopes for Seuss becoming a doctor. He attended and graduated from Dartmouth College in 1925. While at Dartmouth he was an active member of both Sigma Phi Epsilon and Casque and Gauntlet. Some of his first articles were published in the humor magazine, Dartmouth Jack-O-Lantern. Geisel was encouraged to continue his education so he attended Lincoln College at the University of Oxford, with the intent of earning a doctorate in literature, and fulfilling his father's dream. However, he met Helen Palmer and the couple married in 1927. The two returned to the United States and Geisel never finished his studies at Oxford. As a result he decided to put "Dr." at the front of his chosen pen name "Seuss," so that his father could say his son was indeed a doctor. The name Seuss was Geisel's mother's maiden name, pronounced like "voice," though most American's pronounce it like "juice." Geisel began writing intently after his marriage, submitting humorous articles (along with original illustrations) to several magazines. Among these were Judge where he first began using his pen name "Dr. Seuss," the Saturday Evening Post, Life, Vanity Fair, and Liberty. During the Great Depression, he found work by drawing advertisements for General Electric, NBC, Standard Oil, and many others. His first attempt at being a cartoonist was a short-lived comic strip called Hejji in 1935. 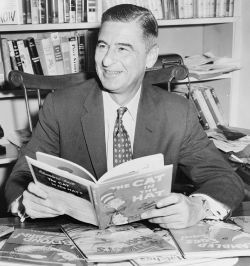 Dr. Seuss wrote three children's books in prose, including And to Think That I Saw It on Mulberry Street, before he found his unique rhyme and rhythm. He took a break from his fictional writing and began making strong political statements in the form of cartoons, articles, documentaries, and eventually military service in World War II. From January 1941 to January 1943, he joined Frank Capra’s film unit of the U.S. Army Signal Corps. He drew over 400 cartoons for the New York City left-wing daily newspaper PM. His cartoons expressed more right-wing sentiments on the vileness of Hitler, Mussolini, and even Charles Lindbergh (who voiced his discontent over America joining the war effort). His cartoons made statements against racism and isolationist leaders, praising every decision by President Roosevelt during the war. Seuss admired the president and was very patriotic. In 1942, he began drawing posters for the Treasury Department and the War Production Board. In 1943, he became a commander of the animation department of the First Motion Picture Unit of the United States Army Air Forces. He made several propaganda films about peace and earned Academy Awards for Hitler Lives (1946); for the documentary feature, Design for Death (1947); and for the animation short, Gerald McBoing-Boing (1951). He ended his service and was given the Legion of Merit award. At the war's end, Seuss and Helen settled permanently in La Jolla, California where his writing continued in earnest. He went on to write If I Ran the Zoo (1950), Scrambled Eggs Super! (1953), On Beyond Zebra! (1955), If I Ran the Circus (1956), and How the Grinch Stole Christmas! (1957). His direction and goals as a writer changed when he read an article on illiteracy in the May 1954 issue of Life magazine. The article stated that the rise of children's illiteracy was due, in part, to the lack of interesting reading material. Seuss' publisher gave him a list of 400 of the most important words a child should be reading, and asked Seuss to cut the list down to 250 words and write a book; thus, the history of the 220-word story, The Cat in the Hat, Dr. Seuss' most popular book. Next, he wrote Green Eggs and Ham a book that is said to have been written as a result of a bet. Publisher Bennett Cerf bet Dr. Seuss $50 that he could not write an entire children's book using only 50 words. Dr. Seuss proved to be up to the challenge; whether Cerf ever paid up is not known. Seuss had an affair with Audrey Stone Dimond, a woman eighteen years his junior and married with two children. On October 23, 1967, suffering from a long struggle with illnesses including cancer—as well as emotional pain over her husband's affair—Seuss's wife Helen committed suicide. Audrey Dimond divorced her husband and Suess married her on June 21, 1968. The two remained married until Seuss' death on September 24, 1991 at his home in La Jolla, California, at the age of 87. Many honors were given to Dr. Seuss, including two Academy Awards, two Emmy Awards, a Peabody Award, the Laura Ingalls Wilder Medal, and the Pulitzer Prize. He also has a star on the Hollywood Walk of Fame. The Dr. Seuss National Memorial Sculpture Garden opened in 2002, located in his birthplace of Springfield, Massachusetts; it features sculptures of Dr. Seuss and several of his characters. Seuss employed this meter in his works during most of this career, however, in his later works he did not adhere to this meter as strictly. It is obvious that Seuss' use of meter is one of the major hallmarks of his writings, a hallmark that has never been imitated. Seuss also explored trochaic tetrameter, which consists of an arrangement of four units each with a strong beat followed by a weak beat. Seuss enjoyed illustrating his books as much as he enjoyed writing them. His style was distinctive and original. He began using simple pencil drawings or watercolors, but as his books grew in stature, his artistic talent grew as well. Most of his illustrations were made with black ink on white paper, and one or two colors. Seuss' characters and buildings are usually round and somewhat droopy. Both the faces of the Grinch and the Cat are floppy and full, with rounded bellies. He rarely used straight lines, in fact, he emphatically avoided them. To many readers it is his characters that stand out, but to true fans, the architectural creations of Seuss are just as important and amazing. He created elaborate palaces, ramps, platforms, and free-standing stairways. He invented several machines, including the most famous one, the Audio-Telly-O-Tally-O-Count, from Dr. Seuss's Sleep Book. Seuss added extravagant detail to his drawings of feathers and fur, as in the 500th hat of Bartholomew Cubbins. Seuss was able to convey vivid motion in all of his books. He loved drawing his characters making grand gestures, where the hand is flipping outward, the thumb up and the fingers slightly spread, a type of "voilà" gesture. More than gestures, he also showed motion with the old tradition of using lines, for example, in If I Ran the Circus, there are sweeping lines that indicate the swiftness of Sneelock's final dive. His early experience in cartoon drawing helped him not only convey motion, but also to illustrate the various senses of sight, smell, and sound. He used lines to portray even the Grinch's evil thoughts. The Lorax (1971) has been said to be a commentary on environmentalism. The story explores the ill-effects of a ruthless industrialist (the "Once-ler") who completely destroys his environment and inevitably causes the closure of his own company. The Sneetches (1961) is seen as a satire on the injustice of racial discrimination. The Butter Battle Book (1984) written in Seuss' old age, is both a parody and a personal denunciation of the nuclear arms race. It was attacked by conservatives who felt that Seuss' comparison between the Cold War and a battle of bread and butter was debasing and trite. The Zax has been seen by many as a parody of political hardliners. Yertle the Turtle (1958) has been compared to an allegory of tyranny, while at the same time advocating the power of political activism. In How the Grinch Stole Christmas (1957), Seuss made his religious values known with his underlying theme of fighting against materialism. Thidwick the Big-Hearted Moose (1948) can be seen as an anti-hunting statement. Horton Hears a Who! is said to be a response to the atomic bomb. Seuss refused to let any of his characters be recreated for film and other mediums; however, he did approve some cartoons. Among these was the 1966 version of How the Grinch Stole Christmas! ; the cartoon was created by Chuck Jones, Seuss' friend since the war. It is a faithful adaptation of the original book and is considered to be a Christmas classic, appearing in the annual catalog of Christmas television specials. A few other works followed, including Horton Hears a Who!, The Lorax, and The Cat in the Hat. As Seuss grew older he became more lax in his stance against adaptations and allowed several other cartoons to be made. After his death in 1991, his wife Audrey was left in charge of all licensing matters. Thus, a live-action variation of How the Grinch Stole Christmas! was made starring Jim Carrey in the title role. In 2000, the Broadway musical named Seussical debuted. With the success of these two adaptations, a live-action version of Cat in the Hat starring Mike Myers was released in 2003. Audrey, however, seriously disliked Myers interpretation of the Cat, and declared that there would be no further live-action adaptations of Seuss' books. The Universal Orlando Resort's Seuss Landing theme park in Florida is full of Seuss' creations, staying true to the books with curving designs. And To Think That I Saw It On Mulberry Street, Horton Hears a Who! McElligot's Pool, If I Ran the Zoo, Happy Birthday to You! Dr. Seuss's Sleep Book, Yertle the Turtle, The Cat in the Hat, How the Grinch Stole Christmas! Green Eggs and Ham, The Lorax, The Sneetches, and Oh, the Places You'll Go! And To Think That I Saw It On Mulberry Street, The 500 Hats of Bartholomew Cubbins, Horton Hatches the Egg, Yertle the Turtle and Other Stories, How the Grinch Stole Christmas! and The Lorax. Come over to My House. Illustrated by Richard Erdoes. Random House, 1966. Horton Hatches the Egg: a 1942 Warner Brothers cartoon, an early Seuss adaptation, which includes the elephant (and his son, at the end) singing a popular nonsense tune of that time, "The Hut-Sut Song." The 5,000 Fingers of Dr. T: a 1953 feature-length live-action movie, with sets that look like classic Seuss drawings and screenplay by Dr. Seuss. How the Grinch Stole Christmas! : a 1966 animated television special directed by Chuck Jones for Metro-Goldwyn-Mayer. Horton Hears a Who! : a 1970 animated television special directed by Chuck Jones for Metro-Goldwyn-Mayer. The Cat in the Hat: a 1971 animated television special directed by Hawley Pratt for DePatie-Freleng Enterprises and CBS. The Lorax: a 1972 animated television special directed by Hawley Pratt for DePatie-Freleng Enterprises and CBS. Dr. Seuss on the Loose: a 1973 animated television special and movie directed by Hawley Pratt for DePatie-Freleng Enterprises and CBS; this special included the stories The Sneetches, The Zax, and Green Eggs and Ham. The Hoober-Bloob Highway: a 1975 animated television special directed by Alan Zaslove for DePatie-Freleng Enterprises and CBS. Halloween Is Grinch Night: a 1977 animated television special directed by Gerard Baldwin for DePatie-Freleng Enterprises and ABC. Pontoffel Pock, Where Are You? : a 1980 animated television special directed by Gerard Baldwin for DePatie-Freleng Enterprises. The Grinch Grinches The Cat in the Hat: a 1982 animated television special directed by Bill Perez for DePatie-Freleng Enterprises, Marvel Productions Ltd. The Butter Battle Book: a 1989 animated television special by Ralph Bakshi for Turner Entertainment. In Search of Dr. Seuss: a 1994 television biopic outlining Seuss's life along with his books. Daisy-Head Mayzie: a 1995 animated television special by Christopher O'Hare for Hanna-Barbera Productions (posthumous). Kids for Character: a 1996 animated television special by Character Counts! (posthumous). How the Grinch Stole Christmas! : a 2000 live-action film (posthumous). ↑ “Porsche” and “Neanderthal”: Pronouncing German Words in English 2. About: German Language. Retrieved March 22, 2007. ↑ Dr. Seuss Went to War: A Catalog of Political Cartoons by Dr. Seuss. Mandeville Special Collections Library. Retrieved April 3, 2007. Theodor Seuss Geisel: The Early Works, Volume 1. Checker Book Publishing, 2005. ISBN 1933160012. Early Works Volume 1 is the first of a series collecting various political cartoons, advertisements, and various images drawn by Geisel long before he had written any of his world-famous books. The Secret Art of Dr. Seuss. By Audrey Geisel. Random House, 1995. ISBN 0679434488 – contains many full-color reproductions of Geisel's private, previously unpublished artwork. Dr. Seuss at the Internet Movie Database. Dr. Seuss on the Web. This page was last modified on 11 October 2017, at 19:45.